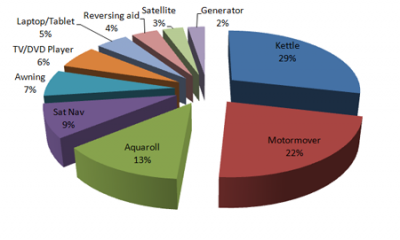 Results of Community Poll: Your most essential piece of caravan or motorhome equipment is…. At the bottom of the list with a just a few percent of the votes we have generators, satellites and reversing aids. Turns out you ‘vanners wouldn’t prioritise computer access when touring as laptops and tablets earned just 5% of the votes putting it into 6th place. A number of you commented on the blog and put your own suggestions forward for ‘must have items of touring equipment’. These included having your own toilet facilities, wine racks, bottle openers, mini spirit levels, solar panels, slow cookers and torque wrenches. On to the top five voted for items now and it looks like it’s outdoor space you’re after as awnings picked up 7% of the vote. Above that, with 9% of the vote, we have every driver’s must have companion, the sat nav. Ensuring you don’t get lost on the way to your campsite is an obvious priority! But coming in at number one, with a massive 29% of the vote, as chosen by you, we have the kettle! So it seems that no trip is complete without a good cuppa’! forgot a few things … fire extinguisher and fire blanket, smoke and CO2 detector, hook up lead, unless you are planning to use 12v only, a torch, plus batteries. you’ll need a water pump if you have water containers, this SHOULD be supplied with your ‘van or motorhome though..
a small tool kit wont hurt either…. Hi Sue, some really good suggestions there, thanks! It sounds like you’re fully equipped for every situation! Click here to vote in our latest poll and don’t forget to share your comments. a step, spare wheel, gas bottles, use ‘red’ gas (propane) if you are planning to camp in england, its good for cold weather… battery, mirrors if you are towing, a corner steady winder..
wheel chocks and levels guarantee you’ll need them on a pitch when you dont have them. 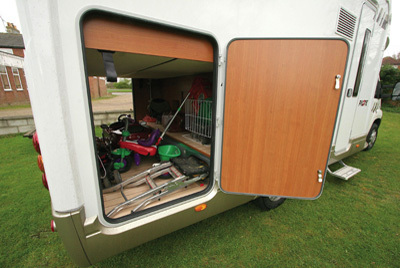 Being new to motor home family i would have expected and hoped for more constructive and use full advice.”Not a kettle”. IE: Must have pieces of kit which make life more comfortable and easier, or could be a problem if you do not have something?. As i said new to motor home`s and would have liked good ideas from survey.